P.E.Blake & Son offers a range of haulage solutions, including temperature-controlled distribution for all types of substances, whether it be heat sensitive chemicals, fresh produce, or non-food cargo. We are specialists in refrigerated haulage and operate a range or refrigerated vehicles, locally and nationally. • Daily collection anywhere in the UK and Europe*. • Scheduled Groupage and Full Load services. • Full, Part Load, Groupage, Pallet and Parcel consignments. • An average 3 day Groupage transit time. • Professional, ADR certified drivers. • Total market coverage including mainland Europe, Scandinavia and Ireland. • A complete range of international vehicles, from Tilt Trailers to Supercubes, Road Trains and Low Loaders. • A dedicated express service and courier options. • Import cargo arranged by our European hubs. • Customs clearance arranged for non EEC goods. • Full insurance cover, proof of delivery and C.O.D.s available on request. Throughout the delivery chain maintain constant contact with our drivers, all vehicles are fitted with in-cab phones and traffic monitoring software. Working closely with our customers, we ensure all needs are met whilst remaining cost effective. 24 hour contacts are available, so you can be sure of when your goods will arrive. We pride ourselves on our customer service and many of our clients have been with us for several years, speaking volumes for the service we provide. 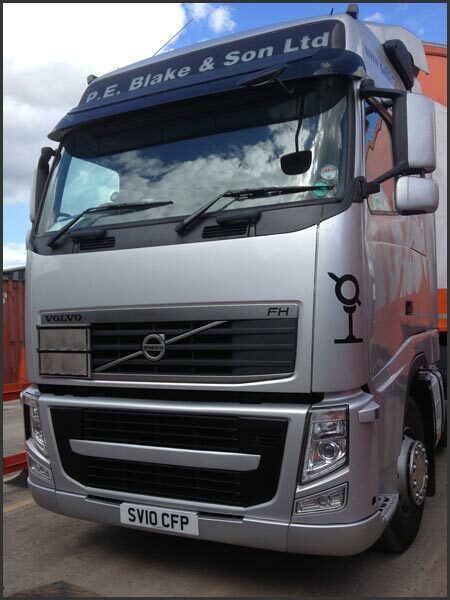 As well as with its haulage expertise, P.E.Blake & Son offers a comprehensive storage warehouse facility. We can store almost any type of goods, palletised or loose, such as; drums, IBCs, machinery or unusual freight. Along with this we have all kinds of handling equipment including an overhead crane, forklift trucks, drum grabs and fork extensions. If you have any transport needs, please contact us and we will be happy to provide you with a swift, professional and friendly service.